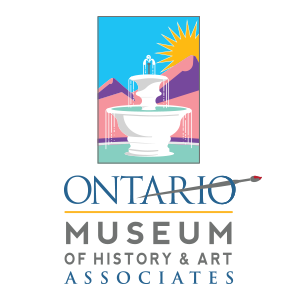 The Ontario Museum of History & Art, Associates is an all-volunteer organization dedicated to providing support for the programs of the Ontario Museum of History & Art. The Museum Associates provide volunteer staffing, raise funds through membership dues and individual donations, grant-writing, and operation of the Museum Store. The Museum Associates is a 501(c)(3) nonprofit support group for the Ontario Museum of History & Art. They provide support financially, through fundraising and membership efforts; educationally, through support of the docent program; and throughout the community with representation at events and activities. The Museum Associates was established in 1996 as an offshoot of the original Friends of the Museum. For the last 20 years the Museum Associates have actively supported the Ontario Museum of History & Art’s education programs and community events. Every year they fund the docent education program and provide volunteers to help make these programs successful. Over the last year, the Museum and Museum Associates’ efforts have seen a marked increase in educational tours for local schools and expanded efforts to reach senior groups, Girl & Boy Scout Troops, and greater community involvement.